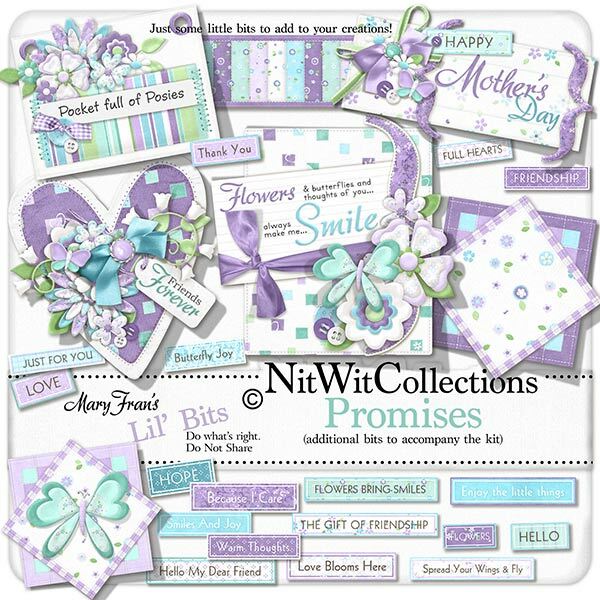 Lil' Bits "Promises" contains many of the premade extra embellishments and wordart tags that you may want or "need" for your card, layout, or hybrid project. Have a look at the "Large Preview" of this item to see what will inspire you! Elements in the Lil' Bits are not included in the "Promises" FQB. 1 Mat Square - if you print it and roll it up, then squares will go into rounds! 1 Wordart - "Happy Mother's Day"
1 Wordart - "Happy" and the rest is for you to fill in. Perhaps Happy Birthday, or Happy Easter?? 1 Wordart - "Pocket Full of Posies"
18 Wordstrips with some great phrases to be able to transform this versatile Lil Bit and Collection into whatever creation this Collection has inspried in you!